Can you cut on granite? One question that often pops into shoppers minds when considering granite is, “Can I cut on it?” This seems to be a very important question for many people who live a fast paced lifestyle or who simply just don’t like cleaning extra messes…Then again, who does? To answer this question, most counter experts would tell you that it is okay to cut on your granite as granite is such a dense material that it will not bear damage, although a knife expert would advise you otherwise. Because of the granite’s rock solid properties, your knives can become dull from cutting on anything other than an appropriate cutting board. So in summation, if you don’t care about your knives, feel free to cut away knowing your resilient granite countertops won’t sustain any damage. A second question that customers always seem to be inquiring about is “Does granite scratch?” Now this relates similarly to the first question. Since granite is such a robust material, it will almost never scratch. With granite being the third hardest natural substance behind diamonds and sapphires, it has a pretty slim chance of sustaining any scratches. When doing any kind of home or kitchen remodeling, like backsplash removal or even simply just granite installation on its own, you won’t have to worry about any surrounding granite or new granite enduring scratches from other neighboring components. The last thing I want to address in this post is staining, as this gets asked over and over again when customers are considering granite. First and foremost, granite is very difficult to stain unless it is extremely porous. About 90-95% of all granite is not porous so you are looking at a minute possibility of it sustaining stains. 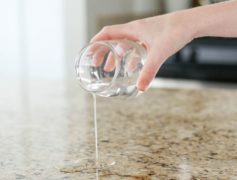 With this in mind, you still want to protect your granite counters with a proper amount of sealer, but that is all you will really need to worry about. Now, I don’t want to overwhelm you guys with too many do’s and don’ts here, but I just wanted to go over some FAQ’s and basics about granite. Please know that anyone is free and welcome to reach out to me with any further questions or concerns. I hope this has helped some of you and wishing you all a wonderful rest of your day.